Fantasy Fiction has an ever-evolving nature. Throughout the years there has been a number of prominent authors who had the ability to alter its natural course. Some of them heavily influenced the genre to the point that whole new sub-genres were created, and others nudged it to a new direction ever so slightly that was barely even noticeable, but helped modernize the genre all the same. Peter Newman is one of the latest. The only safe place left for humanity is the side of the Godroads. The Wild is infected by Demons, and the only thing keeping them at bay are the Deathless. Immortals from seven royal families who have ruled for centuries, every time they die they get to be reborn in the bodies of their family. But when a scheme to murder a Deathless and all of his descendants is exposed, the fragile balance shatters, bringing all kinds of hell loose in the world. Below, she could see miles and miles of unconquered woodland spreading in every direction: the Wild. Strange. Threatening. The very sight of it chilled her, and in the dark it was all too easy to imagine it growing, reaching out to engulf the road-born who dwelled on its perimeter. She couldn't imagine living so close to death. How do they sleep down there? She wondered. How do they bear it? Peter Newman first got our attention with The Vagrant. A fresh and exciting debut told by a unique voice and with an unparalleled prose, it made a sensation in the fantasy community. The sequels were equally impressive, establishing Newman and bringing him one step closer to becoming a household name. But a lot of people, including me, held their breath, waiting to see what comes next. Was the success of the The Vagrant trilogy just a one time thing simply because Newman offered something different, or can he replicate his success with another series? After finishing The Deathless, I can assure you that, without a doubt, Peter Newman is here to stay. 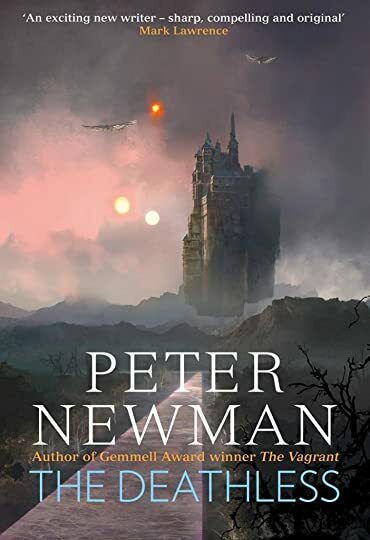 The Deathless takes place in a complete new setting and no previous knowledge is required, although people who have read Newman's other trilogy will see an easter egg or two, connecting the two worlds. The world in which The Deathless takes place, the whole setting even, is bizarre, but that is to be expected. Newman likes to build his own distinctive world that will be memorable enough to stand out among myriads of other fantasy settings. His characters are exceptionally well-fleshed-out, staying close and occasionally crossing the obscure, thin line, separating hero from villain. The story itself is intriguing and provocative, but it's the compelling prose and captivating imagery that tops it off. Finally, as is the case with The Vagrant, The Deathless works as a standalone. I'm confident that it will sell good enough to guarantee a sequel, and more accurately a complete trilogy, but as opposed to other entries in new fantasy series, you can read this one and get a satisfying ending. The Deathless is out on June 14, 2018. You can pre-order it here.